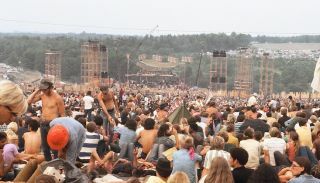 The escalation of large-scale rock touring in the ’60s challenged tour sound production companies to provide superior sound coverage and intelligibility for unprecedented numbers of fans at massive, and oftentimes unorthodox, locations, like the Woodstock Music and Art Fair. JBL met this challenge by providing a variety of loudspeakers and components that could be assembled and deployed as proprietary speaker systems. Looking back on 70 years of JBL is a journey through hundreds of patents, countless category-defining products, and a global reach of more than 130 countries. The brand now known as JBL dates back to 1946, but the company’s foundation began taking shape years earlier during founder James B. Lansing’s pioneering work in cinema sound. After the success of “talkies” inaugurated the sound era of motion pictures in the late 1920s, Lansing worked to develop loudspeakers for theaters, involved in creating the components for the first cinema standard loudspeaker—the Shearer Horn system. His work in cinema led to his developing the very first studio monitor, known as the Iconic system, and he continued pioneering new loudspeakers well into the early 1940s, developing products that became cinema, studio, and radio broadcast standards. Seeking to produce more powerful and sophisticated loudspeakers, Lansing founded JBL at a small factory in San Marcos, CA on October 1, 1946. It was there that he laid the guiding principles for all JBL innovations to come. He quickly found success producing loudspeaker components like the D130 15-inch cone loudspeaker, introducing the use of 4-inch ribbon wire voice coils for low-frequency drivers, and becoming an early adopter of the Alnico V magnet, which established JBL as a leading manufacturer in the industry. With the implementation of new materials, technological advancements, and production methods came entirely new ways of incorporating Lansing’s advanced loudspeakers. In order to further the dialogue between JBL and other music professionals, the JBL Professional Division was launched in 1968. The division developed studio solutions to equip engineers with the tools they needed to adapt to quickly changing recording techniques. Among these innovations were the C50SMS7 studio monitoring system for Capitol Records in Hollywood and the 4310, the very first “bookshelf” monitor system that propelled 8-track recording in the late 1960s. The escalation of large-scale rock touring in the ’60s challenged tour sound production companies to provide superior sound coverage and intelligibility for unprecedented numbers of fans at massive, and oftentimes unorthodox, locations. JBL met this challenge by providing a variety of loudspeakers and components that could be assembled and deployed as proprietary speaker systems. Some of the earliest products used for sound reinforcement include the JBL 4560 “bass bins,” acoustic lenses, and 2350 radial horns. In the 1980s, JBL developed the Concert Series, which took advantage of new component technology, including Flat-Front Bi-Radial horns, extended range compression drivers, and Symmetrical Field Geometry (SFG) cone transducers. By 1985, technological and production improvements allowed JBL to produce a rugged, low-cost, and high-quality small loudspeaker to suit studio applications as well as meet increasing demand for installed sound speakers. The original Control 1 brought the technology of flagship JBL models into a compact, 5-inch, two-way loudspeaker and paved the way for modern commercial installations. Capitalizing on the rise of the personal computer, JBL developed the Central Array Design Program (CADP) that optimized the complex technology of arrays for large installations. Now the same modeling tools JBL used to design transducers, magnet assemblies, and waveguides allowed contractor customers to model sonic settings and optimize their sound systems. JBL continued advancing sophisticated computer control software by bringing the original SMAART analysis program to the public in 1996. The brand now known as JBL dates back to 1946, but the company’s foundation began taking shape years earlier during founder James B. Lansing’s pioneering work in cinema sound. These days, as part of the Harman family, JBL benefits from developing products synergistically with other Harman brands—leveraging amplifier technology from Crown, signal processing from dbx, and more to create complete pro-audio solutions. As for the future, JBL aims to continue pushing the understanding of the laws of physics to provide better coverage patterns, sound quality, and technologies for an all-encompassing audio experience. “We’ve worked hard to earn our reputation for the best quality audio in the market and are working even harder to improve on it,” said Bryan Bradley, senior vice president and GM, Entertainment Division, Harman Professional Solutions. “For example, JBL continues being one of the only brands that manufactures our own parts. We don’t just buy a transducer off the shelf, we manufacture it to the perfect spec.